With the warmer months taking a back seat, the time has come once again for us to prepare ourselves for an icy winter. Getting your home prepared for some serious chill before it hits is always advisable, and in this article we will look into how you can do so in an eco-friendly and cost effective way. Read on to find out more! 1. Get Your Heat On! We are all too familiar with this scenario - winter hits, you crank the heating up and when the bills arrive in the mail, you almost have a mini heart attack at how much it has racked up to be. Fret not, because we have all been there. In a bid to avoid skyrocketing electricity bills, you may want to consider investing in energy efficient heaters instead of the usual. Energy efficient heaters are extremely cost effective, and provides you with gentle and targeted head when you need it most. Skip the gas heating and switch to energy efficient today. This one is something not everyone has heard of. Did you know that one of the easiest ways to preparing your home for winter (and also one of the cheapest!) is to run your ceiling fans in a clockwise direction instead of anticlockwise. Why? Well, running it clockwise will ensure that it is pulling warm and heated air from the ceiling and recirculating it into your home. Taking this measure can cut your heating costs by up to 10 percent and is one of the most eco-friendly ways to bring some warmth into your home. Time to switch it up! Do you have hardwood, concrete or tiled floors in your home? If so, placing rugs down is one of the simplest ways in which you can bring some warmth into your house. Tiles and hardwood flooring often have a chilly underfoot during winter, and covering these surfaces up with a nice, warm and shaggy rug is a great way to keep things toasty indoors. Furthermore, rugs are inexpensive and you won’t be having to crank that heater up to such a high temperature, thus saving both your wallet and the environment! (Who doesn’t love a gorgeous new rug as well, anyway?). When it comes to the bedroom, investing in the right kind of bedding can make all the difference when it comes to keeping warm. Most people recommend wool and feather quilts for the icy winter months, as they provide maximum warmth compared to cotton or microfibre quilts. Ensure that your quilt is thick enough as well - the warmer and comfier your bed is, the less chance of you having to keep the heating on all night long. That’s 8 hours a night, for a whole three months - imagine how much energy and money you will be saving if you can forgo using the heat during bedtime! Did you know that if cold air is creeping into your home from underneath your doors, you are probably wasting between 10-30% of your home’s energy? Ensuring that there are no drafts entering your home can be a great way to cut on the power bills. If you sense that this is the case, a simple hack would be to keep cold air out by placing a rolled up towel in the space between your floor and door. This costs nothing, but will truly help you cut down on your power usage in the long run. 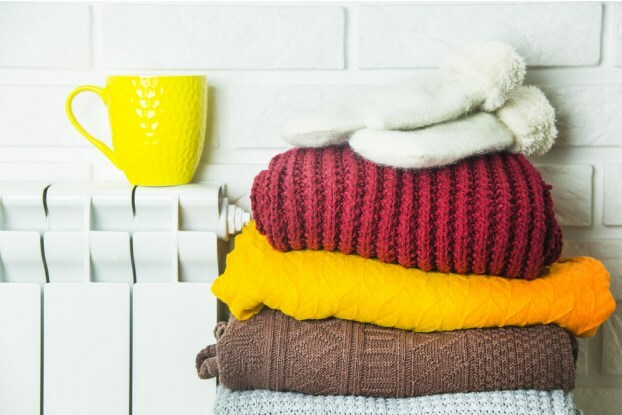 We hope that this article has come in handy and has given you some ideas when it comes to preparing your home for winter in an eco-conscious and cost effective manner.